I can’t juggle, unless you count juggling a separate remote control for every piece of gear in my entertainment center. A task like watching a movie means changing an input with one remote, grabbing a second remote to push the play button, and controlling the volume with a third. Blumoo is designed to replace all your remotes—and it lets you customize the perfect virtual remote with only the controls you want, exactly where you want them. Oh, and there’s also the extra bonus of adding Bluetooth streaming to your older audio gear. Blumoo works like the Logitech Harmony Ultimate Hub, receiving signals from a smartphone app and then blasting out the approrpriate IR signals to control your TV, stereo receiver, DVD and Blu-ray players, CD player, cable box, whatever. While the Ultimate Hub connects to your smartphone over Wi-Fi, Blumoo uses Bluetooth 4.0, so it works even if your Wi-Fi is down. It’s easy to set up, and while the app badly needs a makeover, it’s a convenient way to make all your entertainment gear work together smoothly, regardless of brand or vintage. 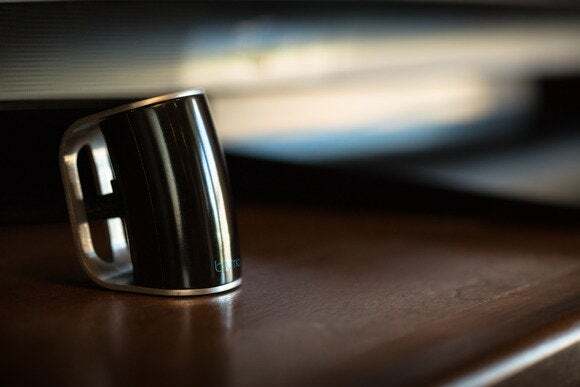 The Blumoo device, called the HomeBase, is about 2 by 3 inches, looking like a small futuristic coffee mug. One wire trails from the back, leading to a connector with ports for the AC power brick, the included 3.5mm-to-RCA audio cable, and an optional infrared extension, which isn’t included. All you have to do is plug it in and set it near your home theater gear. The first thing the app has you do is find your TV. (Also, Blaupunkt?) And when it successfully turned my TV on, I had a little "wow" moment. The audio cable only needs to be connected if you’re intereseted in streaming audio from your phone (or tablet, or computer) to a stereo receiver or set of powered speakers using the Blumoo’s Bluetooth. I connected the included cable to an unused RCA input on my receiver, but you can sub in a 3.5mm-to–3.5mm audio cable if your system has that kind of input. You also need to install the app on a smartphone or tablet running Android 4.0 or iOS 6.0, and your iOS device has to support Bluetooth 4.0, so that’s iPhone 4S, iPad 3, and iPad mini and newer. There’s no native iPad app, which is a shame, but the iPhone app’s overly small buttons actually benefit from being blown up to 2x on an iPad screen. Blumoo supports 200,000 devices, and the app makes adding new ones easy. I had to scroll through a huge list of brands to find Toshiba (my 7-year-old, non-smart HDTV) and Sony (my 15-year-old stereo receiver), but after that it’s a simple matter of letting the app test various power codes to turn your particular model of device on or off, while you report whether each one worked. If the app says it doesn’t have a power code, that means it can’t turn that device on or off to confirm for you that it’s working—that’s the case with the Apple TV and some other gear that doesn’t get power-cycled enough to have a button on the remote for it. If you see that message, just add the device anyway and use its remote screen to test whether it’s working. When you’re using the app, you can swipe between the virtual remotes for each of your devices, or tap the Home button to see a grid of every device you’ve added. But the real power comes from customizing those remotes. My custom remote is a thing of beauty, with all the functions I use most on my stereo, TV, and Apple TV, along with a strip of macro buttons in the middle. Tap the blue “hamburger” button in the top-left of any of the remotes to tweak the default setup to your heart’s content: You can move buttons, delete buttons, rename buttons, or even remap them to different features. If you never use the number pad on your remote, get rid of it. If you ever want it back, just add it back. Better yet, you can add new buttons that do whatever you want, even macros that use multiple pieces of gear. For example, to switch inputs with my TV’s regular remote, I have to press Input, then use the arrow buttons to select HDMI 1 from a list, then press OK. With the Blumoo remote, I made a button that does all that with one tap, and labeled it HDMI 1. I also made a button for watching movies that does kind of a ridiculous amount of things: It turns on the Blu-ray player, and switches the TV’s input to that, while muting the TV’s sound. Then it turns on the stereo, pauses while the stereo fires up, then selects the proper input on the stereo and adjusts the volume to just where I like. All that from one button. That used to be a three-remote juggling act every time. Setting up and tweaking macros is easy to do. This one sets everything up for me to watch a film on my Apple TV. Setting these up can take a while, and one thing the app desperately needs is a way to sync profiles to other phones. Once I got all my stuff set up my phone, I had to do the whole thing again on my husband's phone and then again on our family iPad. First-world, multi-device-household problems? Definitely. But having the app set up on more devices increases the chances that one of them is in arm’s reach—and charged—whenever I’m on the couch. It’s all about not having to get up! Instead of bothering to swipe between the default remotes for each of your devices, you can roll your own with your most-used functions for each thing. Mine has my TV’s volume, power, and a couple key inputs, as well as the directional pad and two buttons for my Apple TV, and some key controls for my stereo. You could even name virtual remotes after people: the babysitter’s could have macros for the things she’s most likely to do, so you don’t have to leave her two pages of typed instructions next to a pile of five real remotes. Once you’ve got the universal remote features up and running and tweaked to your heart’s content, the Blumoo app’s other two tabs feel like inconsequential add-ons, but they do add some value. The Guide tab shows you what’s on TV, based on who your service provider is: cable, satellite, or good old over-the-air broadcast channels in your area. It’s nice but I wouldn’t miss it if it were gone. The Music tab gives you shortcuts to your music apps, so you can stream audio from them to whatever stereo your Blumoo is connected to. If the app doesn’t make the connection for you, you might have to go to your phone’s Bluetooth settings and pair separately with an item called Blumoo Audio. (An error message will let you know if you need to do that pairing yourself.) I was already streaming music to my stereo over AirPlay, by connecting an optical cable from the Apple TV to the receiver. So being able to stream music to the Blumoo with Bluetooth didn’t blow my mind as much as the universal-remote features did, but it’s nice to know I can still stream if my Wi-Fi goes out. While it works just fine, the Blumoo app could use some polish. For starters, it needs resizable buttons. The “normal” size buttons are still pretty small, so the targets are a little tricky to tap, and there’s a lot of wasted space between them on some screens, the Home screen especially. Blumoo doesn't take up a lot of room near your equipment, and you can connect an IR extender if you need to reach any gear stashed away in cabinets. The hamburger button in the top-left corner, which displays the options for each screen, is difficult to tap reliably on my iPhone 5’s screen, usually requiring a few tries. The options screens slide out with little animations, but overall the app’s look and feel are pretty dated. Still, it gets the job done well enough that I find myself staying in the Blumoo app to control my Apple TV and Roku box, instead of switching to the dedicated apps I already have to control those boxes over Wi-Fi. I experimented with just using the Blumoo app instead of any of my old remotes, and it was not only possible, it was better. With a little fiddling to get macros set up and adjusted, I’m able to perform what used to be three-remote dances with just one tap. With a few app updates and a syncing feature, Blumoo will be indispensible. It really can replace all your remotes, but the app that controls everything could stand to look better.